(Phys.org)—Researchers have developed a method for fabricating silicon-based electronics that can be stretched and folded without damage, circumventing the problem of extreme fragility that ultra-thin flexible silicon materials traditionally face. The researchers, led by Muhammad Mustafa Hussain at the King Abdullah University of Science and Technology (KAUST), have published a paper on the foldable silicon-based electronics in a recent issue of Applied Physics Letters. Most of the flexible electronics being developed today are based on polymer materials, but polymers have inferior semiconducting properties compared to silicon. Also, unlike silicon, most polymers are not fully compatible with the standard fabrication processes used in today's semiconductor industry. If silicon can prove to be mechanically robust enough to endure the stretching and bending required by flexible electronics, it would potentially offer an ideal material for realizing commercial flexible electronics on a large scale. In the new study, the researchers take a step toward this goal by designing a silicon-based device made of bulk silicon "islands" interconnected by thin, flexible silicon springs. The thick islands provide the mechanical support, while the thin springs provide flexibility. One of the biggest challenges was to design the microscale springs in such a way as to prevent them from tangling with each other, while still allowing them to stretch to several times their original length. Although the researchers considered spiral shapes and fractal patterns, the best design they came up with was inspired by mimicking nature's spherulite-lamellar motif, a pattern that resembles the radiating lines often seen in rocks. 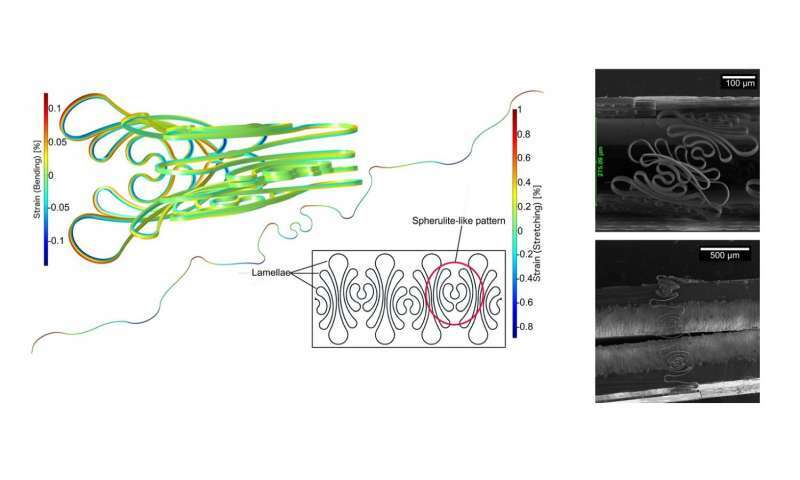 Experiments showed that this geometrical design has the advantage of spreading the bending-induced strain across the entire length of the spring. Due to the stretchable springs, the final device can be stretched to more than five times its original area. The springs also allow the islands to fold on top of each other, resulting in a bending radius of 130 µm, which is independent of the device thickness. "For a fully flexible and stretchable system, we must make high-performance silicon electronics flexible and stretchable," Hussain told Phys.org. "However, in its normal state silicon is rigid and bulky. For years, by thinning down silicon or similar materials, the scientific community has made silicon flexible. By adopting various fractal designs, stretchability has also been achieved. However, such ultra-thin flexible silicon is fragile, so that when stretched, it often fails to retain its mechanical integrity. Therefore, our work decisively addresses all of these concerns by showing a state-of-the-art CMOS-compatible process to achieve flexible and stretchable silicon with sufficient mechanical rigor." 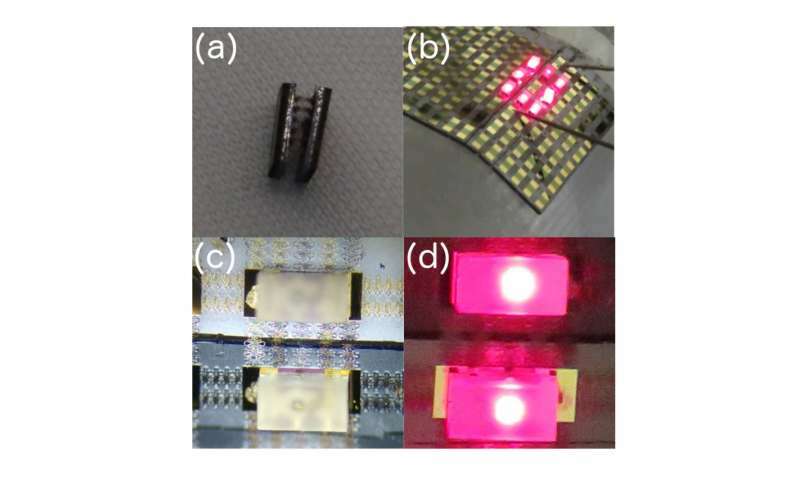 Since the new patterning processes are compatible with current semiconductor fabrication technologies, the researchers expect that this design could be straightforwardly applied to fabricating a wide range of flexible devices. Potential applications include wearable electronics, solar cells that conform to curved surfaces, tactile displays that fold like origami, and 3-D stacking of integrated circuits. Another possibility is detachable electronic components, which are an important part of self-destructible electronics—devices that can destroy themselves when they sense their security being threatened. "We are exploring new application opportunities for electronics to empower humanity," Hussain said. "Our current work involves developing robust manufacturable processes for new applications. In that regard, our next objective is to develop a computational gadget which can be stretched and folded as needed. In the future we also envision implantable electronics that can be reshaped and reconfigured using the developed techniques to comply with the natural growth of a person's body organs."